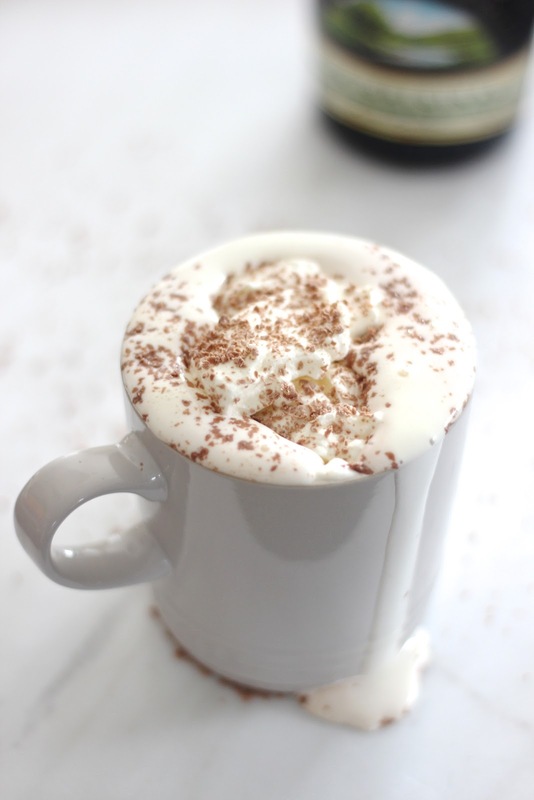 Baileys Hot Chocolate Recipe. | By Millie. For over 18's only, please drink responsibly! To heat up the milk you can either pop in the microwave for just under 2 minutes, or if you're feeling super fancy pop it in a saucepan and heat it up that way. I'll measure my milk in the mug so I know exactly how much I want to use. If you do make this on the stove, wait until the milk comes to a boil, then remove from the heat and add the other ingredients as followed. Once your milk is nicely warmed, add your drinking chocolate powder, I don't have a favourite but I used one from Green and Blacks which was super rich and luxurious! Then add your shot of Baileys and stir. This liquor is lovely in a hot chocolate, it's so heavenly and the perfect festive treat. If you haven't tried it, do, it's amazing! For decoration, feel free to use squirty cream, or you can make up your own using whipping cream. I have a stand mixer, so this step is a little easier but you can also use a handheld mix. I'll pour half a cup of cream into a bowl and mix until it forms stiff peaks. I love adding whipped cream to my hot chocolate as it makes it 10 times creamier when it starts to melt down! Once you're happy with it, spoon it onto your hot chocolate. I'm not a fan of marshmallows, so they haven't featured here, but if you do then feel free to add as many as you like! Instead, I'll grate up some chocolate and add that. I used 2 cubes of plain milk chocolate and the cutest mini grater ever which I'll link if I can find it! Sprinkle your chocolate on top and enjoy! What's your favourite go-to Autumn/Winter recipe?